Knock Twice – can stories can point the way to a sustainable future? It feels like a good time to launch a book of modern folk tales that are entertaining, surprising and troubling. And not just because it’s Hallowe’en. Knock Twice is a collection of new stories. Folk tales throughout history explore the extremes of human experience and help us make sense of them. The image below comes from Norway, drawn by Theodor Kittelsen, born in 1857. 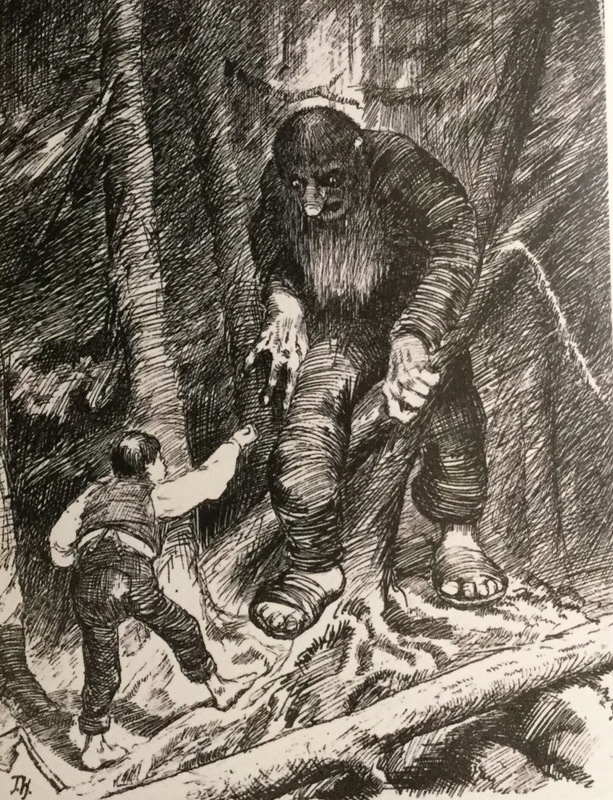 From the folk tale hero Askeladden (Ash Lad) to the water sprite Nokken, stories were a way to connect up Norwegians under the impositions of Danish rule. 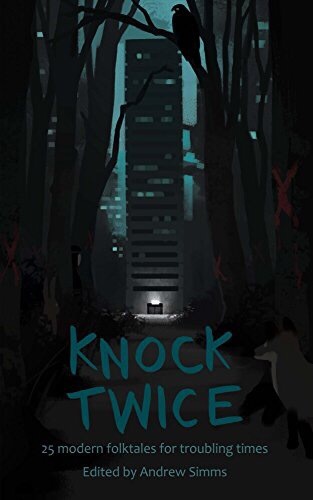 These tales are far our modern times but Knock Twice continues the tradition with modern folk tales, from mobile phones to the refugee crisis, celebrity, climate change and banking. I have contributed one story, drawing on tales I have picked up on my travels in the world of co-operative enterprise. And that’s what makes the book interesting is that the other authors too come from a range of settings on the frontiers of sustainabilty and social change – including leading authorities on the earth sciences, the environment, finance and economics. Knock Twice is curated by Andrew Simms, author of Cancel the Apocalypse and co-founder of the co-operative think tank the New Weather Institute. The book is published by the Real Press, as a paperback, an ebook and a Kindle edition. Are you ever bewildered by the modern world and the prospects for a sustainable future? These are modern folk tales for troubling times because we’re unlikely to get a better world without using our imagination. Is this the happiest co-op video ever? We have been running a series of short videos of inspiring stories of co-ops in the UK, with backing from the Co-operative Bank. The first was Leeds Bread Co-op, which was a wonderful introduction to worker co-operatives. Now, our short video turned to Bristol, filmed by Blake House Co-op, itself an enterprise which has benefited from business advice via The Hive. 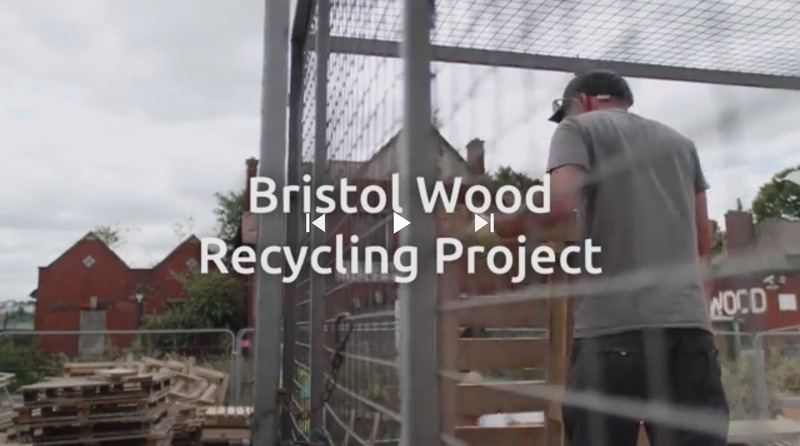 The subject is Bristol Wood Recycling. This is surely the most sunny and happy co-op video ever. So far, we have had 1,800 shares and an astonishing 200,000 views via Facebook. For great communications, there is nothing like a good story. And when it comes to people, it seems there is nothing like a co-op story. I have had the pleasure to visit the co-operative sector in Norway in recent days, courtesy of the Norwegian Co-operative Centre, Samvirke Senteret. The Centre was founded in 2008 by seven of the largest co-operative organisations and now has 32 members with 87,000 employees and close to £15 bn of turnover together. Norway is one of those European countries that has such a strong co-operative presence that it is first taken for read, then taken for granted and finally simply overlooked. Denmark, Austria and perhaps Ireland are in the same club. The data on the sector as a result is partial, but still wonderfully impressive – 9,000 – 10,000 co-operatives across the country as a minimum, possibly thousands more across the housing sector. The most established sectors are retail, agriculture – including forestry and fishing – and housing. Younger sectors include energy, water, transport and kindergartens. The Co-operative of the Year is a car sharing co-op I was pleased to meet. “We have not made anybody very rich, but we have saved a lot of people a lot of money” one of the founders commented. I also visited a social co-operative, Respect by Aurora Verksted, selling high quality clothing and household goods, all made by members with great taste plus a variety of disabilities. Recently, they have started to source from a sister co-operative workshop in Vietnam, extending their values of positive ability and action internationally. The retailer Coop Norway has 1.6 million member across 88 constituent local and regional co-ops, with 1,360 stores. 110 of these are hardware stores. Total turnover is around £5.5bn. 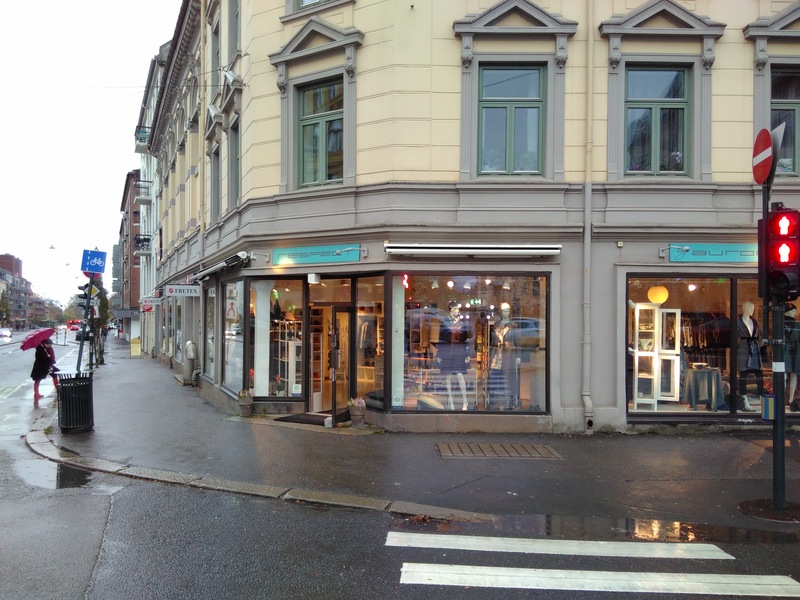 Coop Norway earlier this year released a couple of laugh out loud short videos, in which Silicon Valley geeks reinvent the idea of a store owned by the customers, a “coop”, as the latest sharing economy innovation. Instalment 1 is here and 2 here. 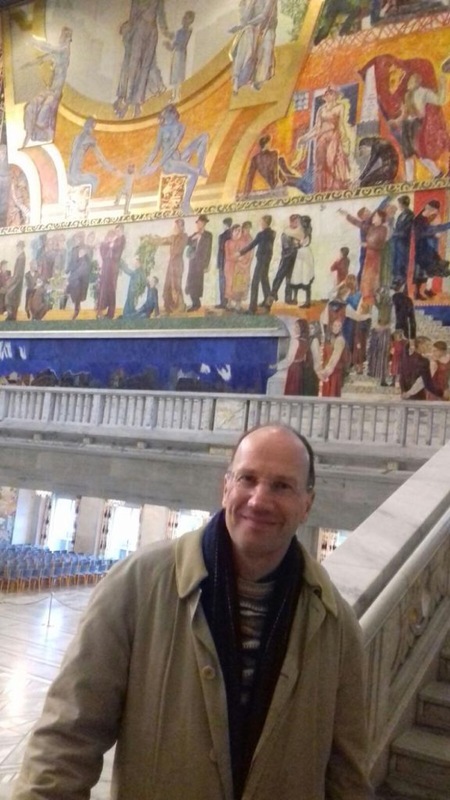 The Chair of Samvirke Senteret is Henning Lauridsen, from the Housing Co-op sector, which has close to one millions members with 490,000 dwellings. Around 60,000 farmers participate in the agricultural co-ops that are members of the centre, with a turnover of £7.5 bn. One is an inspiring potato co-operative, Hoff is leading work to reduce waste and move towards the ‘circular economy’ model of a sustainable business. Owned by four thousand growers, Hoff has diversified beyond its longstanding core of potatoes for Norway’s signature alcohol, Aquavit. While the very first co-op in Norway was a dairy co-op, with 100 cows, set up in 1856 by the Royal Norwegian Society for Development (something it has had a proud track of ever since), there are stories of earlier nineteenth century distilleries for Aquavit, jointly owned but established a share companies. The coop sector came together to win legislation in 2008. This is a general coop law, defining the form and setting a regulatory framework except where sector rules already operated. Now the Centre is exploring how to promote the model, including in new growth areas such as consultancy, arts and tourism. I was over to meet the Board of the Centre, to look at ways to support each other, including in a Brexit context, and to present to their annual conference on our uplifting work with members in the UK on co-operative innovation. All intelligent people can be stupid at times – it just depends on the context. The same is true for technology, which is why the search for artificial general intelligence – a system perhaps that can be stupid less often when the context changes – is the focus of so much interest at present. Like many other organisations, we have been looking at where we can use automation. The shift in functions from holiday booking to sales and accounts to cloud based systems represents an extraordinary shift in organisational life. As a co-operative association, we have embraced the possibilities of digital learning, with a national platform to support new co-operatives, the Hive, with digital resources, diagnostic tools and advice communities, funded by the Co-operative Bank. All this is in line with our mission to promote, develop and unite co-operative enterprise. The organisation, founded in 1869, has always collected data from its members, in order to publish statistics on the sector, for benchmarking and to allow our members to tell their shared story as a different kind of business. What intrigued us was whether we could use artificial intelligence to learn from the data that we have. In particular, when things fail in a co-operative, it is bad news all round, because so many people are both co-owners and have an emotional stake in the enterprise. Could we use the data that we have to spot the early warning signs in a way that supports early action? Neurocomputing is inspired by the working and structure of the animal brain and has prompted the development of neural networks that allow machines to learn in a somewhat similar way. Evolutionary computation is another bio-inspired technology whereby algorithms are iteratively adapted through processes based on natural selection and evolution. Neurocomputing has had success in developing AI products that are now widely in use. In computer vision, neural networks can perform highly accurate image recognition and are being used in robotics, online mapping, and autonomous vehicles. Experimental applications include their use in medical diagnoses, where researchers believe they can be used to analyse radiographs, CT and MRI scans with much greater accuracy than traditional techniques, and drug companies are experimenting with neural networks to process 3D images of molecules with the aim of identifying new drugs. Natural language processing is another area of use of neural networks. ‘Chatbots’ are aimed at automating customer service interactions, and products such as Google Now, Amazon Alexa and Apple Siri, which are built into common consumer electronics, such as smart phones and smart speakers, are using neural networks to provide a voice user interface and language translation. Voice recognition has been common since the mid 1990’s but the addition of neural networks has allowed a radical improvement in the accuracy and usability of the technology. In economics, over the past 20 years or so this new field of study has offered a powerful critique of neoclassical economics and its various assumptions. Leading thinkers like Brian Arthur, Paul Ormerod, Eric Beinhocker and Doyne Farma have all pointed to radically new ways of framing how economies work. As Manfred Max-Neef described it years ago, we might dub this ‘Real-Life Economics’. Our pilot study was to create and train a population of neural networks. Using the familiar evolutionary principles of reproduction, mutation and selection, the population was evolved through several generations to produce a network that performed significantly better than any member of the original population. So we trained the network using a selection of historical time-series economic data on the UK co-operative sector. We then tested the results with the purpose of predicting those organisations that were at high risk of financial difficulty or failure. Using the historic data, we could see that the accuracy of prediction increased from 35.60% – being stupid most of the time – to 51.45% – being intelligent more often than not. The predictions we generated can be used to guide our contact and offers of support for members. Often in a co-operative, preventative work can make a difference. If there is not enough income, there is not enough income, but if the underlying reason is one that can be addressed, such as the quality of governance or the capital structure, then the advice we offer can make a real difference. The downside was the astonishing drain on computing power that was required to run the analysis. We had to use a very high specification cloud computing instance to run this and even that took over two weeks. When the computing finishes though, we then face the human challenge. How do we talk to our members about a prediction that they will fail as a business within one to two years? You might think these things should not be a surprise. Tacit knowledge should always add weight and insight that formal systems won’t capture – which is why some of the interesting work on complexity systems at the London School of Economics by Professor Eve Mitleton-Kelly brings in stakeholders and focuses on an enabling environment to resolve specific challenges. This is the more participative and applied end of a field often accused of producing ‘black box’ solutions. This is where you are told the answer but have no idea why it is the answer (the Watson super-computing system developed by IBM takes this challenge on – how to reconcile complexity and transparency). An unhappy outcome for an individual co-op would be that a prediction of failure that is stupid (wrong) triggers a closure as a result. Thirty years ago, John Butler, a legendary ex-colleague from Co-operatives UK (then the Co-operative Union) went to Clydebank to visit the local, fiercely independent consumer co-operative. Armed with statistics, John argued that the co-op was sure to fail and would need to transfer its engagements to another larger co-op in order to survive. He was sent away with a flea in his ear, the co-op turned itself around without outside help and for thirty years, Clydebank Co-operative has refused to rejoin Co-operatives UK. It was a lesson. When you think you are genuinely being intelligent… now that‘s when stupidity is most likely to catch you unawares. Who are the top membership networks in the UK? 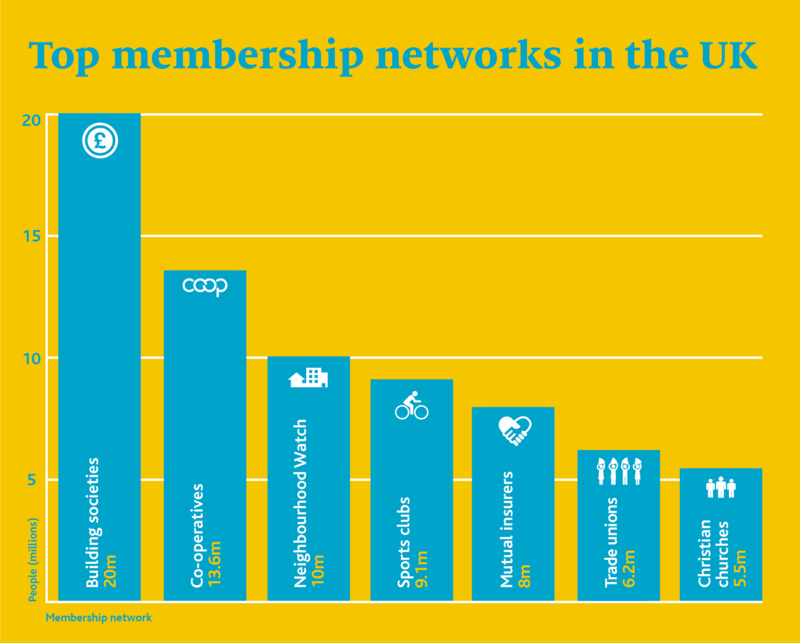 We have updated our stats on the leading membership networks in the UK. Political parties are making a comeback – who would have predicted that? Trade unions down a little further. What stands out are the cooperative and mutual sectors, particularly when you consider that so many sports clubs are probably run on a de facto mutual basis, with one member, one vote. Here are the top seven membership networks in the UK, which I shared this morning at a conference of mutual insurers. I have blogged on this before when we first compiled a list, arguing that the UK is a nation of members. There is no definitive compendium on this, so if you have any additions that we missed, let us know! Nicely, the Co-op Group now publishes an online ticker, open data, of its own membership total: 4.6 million and rising. The co-operative sector stands on the shoulders not of giants but of working people who together achieved giant-sized success. Co-operation is something not just of its day but that cascades down the generations. One of the co-operative women I have met, or rather whose statue I have visited, is Ada Salter. 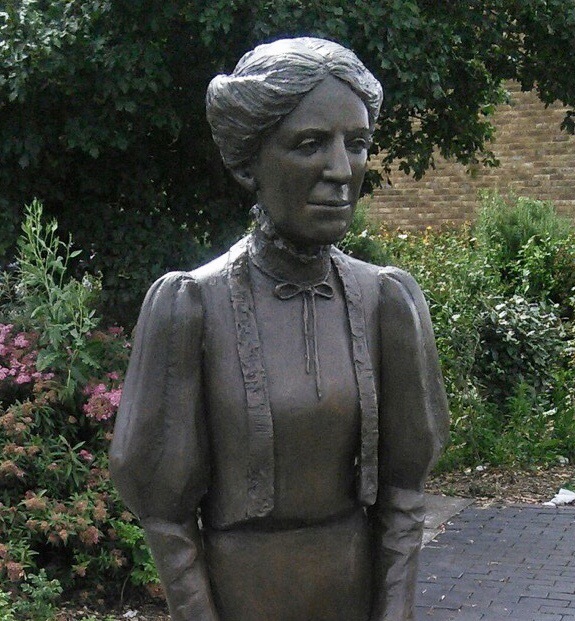 The first female Mayor in London, Ada Salter was a Quaker, a pacifist and a socialist. With her husband, Alfred, a pioneering doctor, she transformed residents’ lives and hopes in and around the South London quarter of Bermondsey, focusing on improving the social and environmental conditions in which people lived. Health outcomes improved, but before they did, her own daughter was one to have died, age ten, of Scarlet Fever. By the 1930s, 7,000 trees in the area had been planted thanks to her work. In 1913, thanks to the Ada Salters, the Labour Co-operative Bakery was created. This started with a staff of 9 baking 5,000 loaves a week. By 1924, there were 100 staff baking 94,000 loaves a week – of good daily bread, and in the co-operative tradition, unadulterated. They paid above the union rate, with hours and conditions among the best of any. Beauty and peace was at the heart of her vision, as they can be ours today.